From a Profitable Sunrise promo. Saying it had “credible evidence” of fraud, the state of Illinois issued a temporary prohibition order in March 2014 against Profitable Sunrise figure Nanci Jo Frazer. The order by the Securities Department of Secretary of State Jesse White also applied to purported Profitable Sunrise operator “Roman Novak,” as well as Profitable Sunrise itself and Inter Reef Ltd.
Inter Reef was a U.K. entity through which Profitable Sunrise apparently was operating. It was not immediately clear whether the temporary order has become permanent or whether Frazer or “Novak” contested it. Unlike state-level Profitable Sunrise actions in 2013, the March 2014 Illinois action alleged that Profitable Sunrise engaged in wrongdoing through Dec. 31, 2013. Various state regulators filed enforcement actions against Profitable Sunrise in early 2013. A 2013 action in Illinois did not name “Roman Novak” and Frazer respondents. The March 2014 Illinois action accused Frazer and “Roman Novak” of fraud and selling unregistered securities while operating as unauthorized salespeople, dealers or brokers. In January 2013, according to the order, an Illinois resident in pursuit of a payout from Profitable Sunrise wired $15,000 to a “Bank in Czechoslovakia” in two separate transactions. Frazer was accused of fraud by the state of Ohio in July 2013. Her husband, David Frazer, is listed on the website of the court-appointed receiver in the Zeek Rewards Ponzi- and pyramid case as a Zeek “winner” of a sum in excess of $1,000. Zeek, the SEC said, was a fraud that gathered hundreds of millions of dollars. Zeek receiver Kenneth D. Bell has raised the prospect that the MLM HYIP sphere may have serial participants in fraud schemes. TelexFree promoter Faith Sloan — currently accused of securities fraud by the SEC — is a former Profitable Sunrise and Zeek promoter. Sloan was banned by Illinois from selling securities in June 2014. Zeek said it paid an average of 1.5 percent a day, according to the SEC. Profitable Sunrise purported to pay up to 2.7 percent a day. Was there ever really a Roman Novak? I think this was maybe worse than Zeek. At least Zeek was in Lexington, NC and there were real people there. I think Frasier and her other “religious” friends made all this up. And the biggest joke of all was the “Easter payout” that fell on April Fool’s day…..big joke on all of us. Johnie Davis: Was there ever really a Roman Novak? The answer to this remains unclear. Johnie Davis: I think this was maybe worse than Zeek. In terms of artifices, Profitable Sunrise might have been the equal of Zeek. The total haul of Profitable Sunrise remains unclear. Zeek came in at approximately $850 million. Johnie Davis: I think Frasier and her other “religious” friends made all this up. Yes. The “Long Haul” plan supposedly would include the so-called Easter gift that supposedly would be paid out on April Fool’s Day, the day after Easter 2013. My theory is that the “Long Haul” was a long-running taunt by the organizers of the scheme and that the Easter theme was used as an artifice to fleece the Christian investors. I also believe that antigovernment extremists and “sovereign citizens” were involved, making Profitable Sunrise an exceptionally dark and dangerous “program.” My operating theory is that Profitable Sunrise married Eastern European and perhaps Asian organized crime to U.S. extremists — and planned all along to let Christians carry the water buckets to create Internet virality. 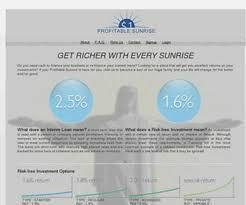 The odds are high, I believe, that the forces that caused Profitable Sunrise to “go viral” also were at work in Zeek and TelexFree. These “programs” are untenable. And they are dangerous beyond measure. Funny thing that all the heat came down right as the easter payout was to be fulfilled. Now the US Governmenet has the funds seized and I can just see those government fat-cat’s licking their chops in anticipation of hoe THEY can get their greedy little paws on it all…. I wonder if there will be a second thought about the fact that the money they have seiaed actually belongs to the people who put it in Novak’s accounts. No doubt Novak ran off with a comfortable sum, and the Government will do the same leaving all the rest of us to loose everything. Funny thing that all the heat came down right as the easter payout was to be fulfilled.Now the US Governmenet has the funds seized and I can just see those government fat-cat’s licking their chops in anticipation of hoe THEY can get their greedy little paws on it all…. I totally agree. I lost about $2,500 which may not be much in the big picture, but I’m not in the big picture… I was about 30 at the time of it crashing… had no job, just small income here & there… and I am still in the same situation. I cannot work, due to disability and yet I also don’t receive any gov’t income. I just got screwed really by the SEC & gov’t… because some people made money… I lost due to timing. Had it made it another few months, I’d be in profit or broke even… and I don’t see anything anymore online, nothing to claim your losses. You’d have been “in profit” from a Ponzi scheme that asserted to pay a dividend of 2.7 percent a day, plus “compounding,” plus tiered recruitment commissions. It is conceivable that, had you emerged in profit, you could have been sued to return it — like the alleged winners in Zeek Rewards. At the moment, there appears to have been no receivership set up. The case against “Novak,” however, continues. It is unclear whether he even exists. You could have been doing business with a ghost. You might want to ask why a ghost would be so interested in targeting Americans, particularly American Christians, apparently from overseas.